The cenotaph on top belongs to Shah Jahan and is located in the Taj Mahal. The Taj Mahal was built by the Emperor (r.1628-58) for his favourite wife Arjumand Banu Begum upon her death in 1631. Constructed of India’s finest marble, it took 12 years to build involving 20,000 craftsmen from all over Asia. 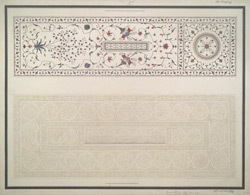 The pietra dura was done with thousands of imported precious and semi-precious stones arranged in floral designs that embellish the exterior and interior of the building, including the top of this cenotaph. The second cenotaph top belongs to the Emperor Akbar and is situated at Sikandra; dated inscriptions show that the tomb was completed by Akbar's son Jahangir (r.1605-27) in 1614. The mausoleum is set in a vast square garden of the 'chahar bagh' plan, a formal garden divided into four sections by red sandstone causeways containing water channels, interspersed with fountains and ponds. The monumental main gateway, in a hybrid style that includes Persian and Hindu elements, is of red sandstone with inlay mosaic patterns of floral and geometric shapes.